Game Buddy gently sticks to most surfaces for easy game access! Have easy access to all of your favorite games. Stick it wherever is most convenient for you! Our patented materials ensure that your games will stay safe and secure in each pocket. They don't fall out even when turned upside down! Customer love the added convenience Game Buddy offers, and we think you will too! Click 'Add to Cart' Now and see why our customers love Game Buddy! 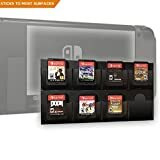 Switch console, game cards, case, and stand in images are for demonstration purposes and are not included. Product does not light up. Glow effects for marketing purposes. ✔ NEVER LOSE YOUR GAMES! Game Buddy can be gently stuck to most surfaces for easy game access! ✔ SATISFACTION GUARANTEED: We are confident that you'll love our product; but if for any reason you don't, just return it for a full refund!